← Hollyweird hypocrite Sean Penn to profit off of gun violence in "The Gunman"
Want to see what a satanist looks like? Take a good look at the fat middle-aged man in the black-&-tan striped polo shirt in the pic below. His name is Marcus Jay Shapiro, a rabid supporter of the abortion mill Planned Parenthood. At an El Centro City Council meeting on March 4, 2015, Shapiro was asked to leave the meeting for threatening a pro-life pastor. Shapiro yelled “Hail Satan!” as he was being escorted out by police. El Centro is a city in the far southeastern corner of California, near San Diego and the Mexican city of Mexicali. A charter city, El Centro owns the local hospital El Centro Regional Medical Center. The members of the City Council are also the Community Development Commission and the Redevelopment Agency governing board. Note: A charter city is a city in which the governing system is defined by the city’s own charter document rather than by state, provincial, regional or national laws. On her blog Saynsumthn, Carole Novielli recounts what happened at the meeting. Some 2,000 people attended the El Centro Council meeting, most of them angry that the El Centro Regional Hospital had signed a transfer agreement for Planned Parenthood to open an abortion clinic — without any public input. 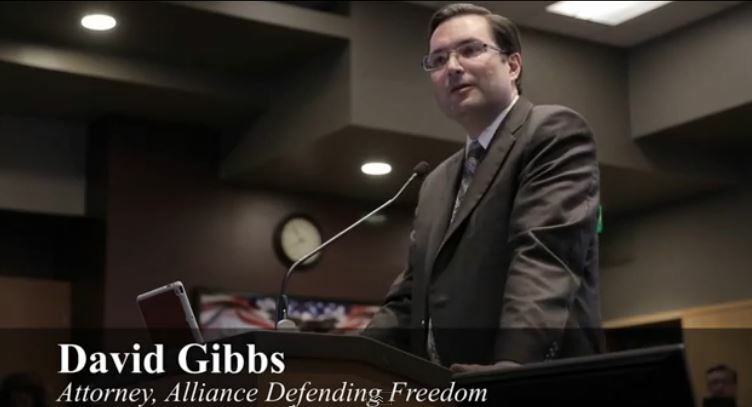 Also speaking before the council was David Gibbs, an attorney for the Alliance Defending Freedom and president of the National Center for Life and Liberty. During his speech, Gibbs said Marcus Shapiro had threatened pastor Colace and asked the city council to have Shapiro removed from the meeting. Gibbs’ accusation is confirmed by members of Christ Community Church at the meeting who said they had eyewitnessed Shapiro saying vulgar things to the pastor, repeatedly using the F word. On the YouTube site of the video, Shapiro was the first to leave comments, insisting that he had not threatened anyone that he believes “Satan is fake.” He also wrote a comment on Novielli’s blog, directed at David Gibbs, spewing another vulgarity while denying that he had threatened anyone at the meeting. Here a pro-choicer left an abortion clinic using the devilish chant. This entry was posted in abortion, Christians/Christianity, Culture War, Evil, Liberals/Democrats/Left, Obama's America, occult, persecution of Christians, Planned Parenthood, Pro-Life, Satanism, United States, war on Christianity. Bookmark the permalink. Occult underpinnings interconnect the wicked in America. It is no coincidence that this man shares a ‘world view’ with Aka Obama and comrades. I am not a comrade of Obama. Were you a comrade of W? Occult? For the record I am a JEW! I just like saying satan stuff because you guys are lame. Why does it seem that the seeds of perversion are always planted in California? It used to be such a bright, happy place…..
From surfboards to satanic rituals in such a short time. What a bunch of sick, twisted nut jobs. I mean, how sick do you have to be to actually want to go to Hell?